Former Liberian head of state Charles Taylor has been sentenced to 50 years in prison for the 11-count conviction at The Hague in April. Taylor, who lived in exile in Nigeria before he was extradited back to Liberia, was found to be instrumental in the brutal war waged in Sierra Leone fueled by the country’s rich store of diamonds. The prosecution had initially sought an 80-year sentence for the warlord, but “the judges found the recommendation ‘excessive’ citing the ‘limited scope’ of the conviction in some points,” according to CNN. If Taylor loses his planned appeals, he is likely to live out the rest of his life in a British prison, as Taylor is already 64 years old. Taylor directed his gaze downward while Presiding Judge Richard Lussick read the sentencing statement, which included a horror cabinet of atrocities committed in Sierra Leone by rebels the former president backed. 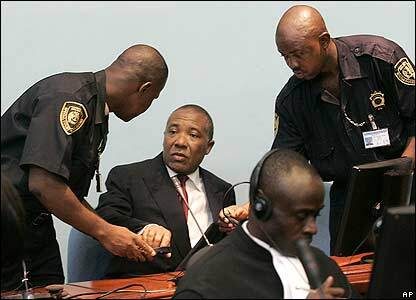 The former Liberian president is appealing his conviction and will receive credit for time already served since March 2006. He does not see himself as a war criminal but as a victim — a leader wronged by corruption and a hypocritical hand of justice with a political agenda. Taylor made a plea for why he should be spared the harshest sentence for his conviction on aiding and abetting war crimes. He said he was saddened by last month’s guilty verdict, in which the court said he had assisted Revolutionary United Front rebels who fueled Sierra Leone’s long and bloody civil war that ultimately left 50,000 dead or missing. Taylor, who has expressed no remorse, has insisted his intent was far from what had been portrayed by prosecutors and described himself as a peacemaker. He blamed money for an unfair trial, claiming prosecutors received millions of dollars from the United States government and witnesses were paid off. Last month’s landmark ruling by the Special Court for Sierra Leone against Taylor was the first war crimes conviction of a former head of state by an international court since the Nuremberg trials after World War II that convicted Adm. Karl Doenitz, who became president of Germany briefly after Adolf Hitler’s suicide.